I may earn a commission from the companies mentioned in this post. Regardless, I only recommend products or services I use personally and believe will add value to my readers. Running your own online business can be A TON of work. You know what I’m talking about – every business owner has to deal with those little tasks that waste their time or they just straight up don’t like. The good news is that you don’t have to do everything yourself; you can (and should!) 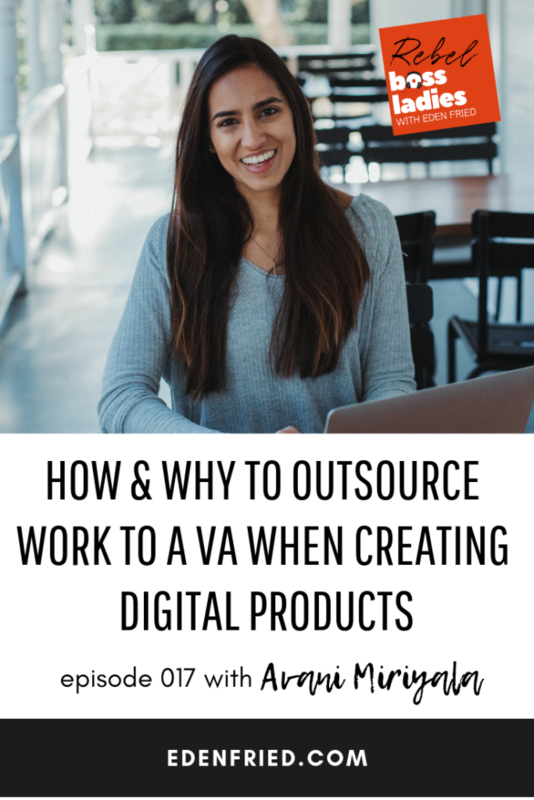 outsource work to a virtual assistant (VA) when creating your digital product. Our guest on the Rebel Boss Ladies Podcast episode 017 is Avani Miriyala. She runs a UX consulting business, sells digital products and she’s a freelancer, business coach, and podcaster. With everything she has going on, Avani definitely needs to outsource her extra work to other people. Today she’s going to talk about why it’s super important to outsource work and how to find the best VA or freelancer to help with your business. Even if you’ve never considered hiring someone else to do work, or you feel like you’re not financially able to right now, this is a great episode to listen to. Avani shares her thoughts on why you definitely need a VA, even if you’ve never considered one before. Avani got her start in the online world in the tech industry. Working as a user experience designer showed her what it means to build really good products. Within her first few months as a freelancer, Avani scaled to 6-figures. She decided to share her success with the world, and since then has been taking her business to new and exciting levels. Avani stresses that you have to go into hiring out work with the right mindset. Creators and business owners should always be working in their zone of genius, and not wasting time on simple tasks. She emphasizes that it’s super important to focus on the things that really matters, which are the high-level tasks of your business. As the visionary for her business, she always wants to be doing the things that produce the most money. The best tasks to outsource, according to Avani, are easy tasks that can be done quickly, or the tasks that drain you as a creator. A lot of business owners feel like they’re not fiscally ready to hire a VA and they don’t want to pay someone for work they can do themselves. Avani recommends thinking about the value of your time if you’re not sure you’re financially able to hire out some of your work. She suggests thinking about how much you make per hour, and comparing it with how much you’d pay someone per hour to do a task that you could outsource. When it comes to your online business, consider outsourcing tasks that you actually lose money hourly when you do them. Her main recommendation? Re-frame your mindset about what your zone of genius is, and how you can accomplish the highest value tasks. Avani considers herself a perfectionist – as a designer, she used to obsess over every pixel of her creations. She admits that outsourcing can be difficult if you’re someone who always wants everything to be perfect. But even if you think you can do it better or quicker, hiring someone to do little tasks can really help you in the long run. Even if it takes a freelancer longer to do work than it would for you, they’re still giving you time that you can use for the more high-value parts of your business. If you’re a perfectionist or have a vision for that particular work, Avani also highlights the importance of giving feedback to your virtual assistant. This means not just doing all of the work yourself when it isn’t done exactly how you pictured it.. But Avani says that doing the work yourself is both not productive and detrimental to you as a business owner. Constantly switching between tasks can be exhausting and is a waste of your energy. Avani says that in order to be the manager of your business and not the technician, you need to implement good feedback systems with your outsourced workers. She uses Asana to let her VA and freelance designers know if anything needs to be changed. Good feedback systems are also essential for building trust between you and your virtual assistant or hired freelancer. Hiring a freelancer is important, not just to help you with lower-level tasks but also to fill a gap in your own knowledge. Freelancers can add a lot of value to your work in areas that you can’t do yourself. Avani’s first freelance hire was a WordPress developer. Her freelancer was able to save her a lot of time and energy because she had limited knowledge in this area. Ultimately, hiring out work that you’re not good at can save you a lot of time, money and virtual blood sweat and tears. There’s someone out there who has knowledge of whatever skills you may lack, whether its Facebook Ads or WordPress design. When deciding what tasks are worth it for you to hire out, Avani recommends tracking what tasks you work on and how much time you spend working on those tasks. The free app Toggl is a great way to keep track of your time. After recording your activities for a week, take a look at where you’re spending most of your time. For each task, decide whether it’s a good use of your time or if it would be better to outsource that work. If you’re spending more time on low-value tasks than high-value tasks, Avani recommends thinking about outsourcing some of that work. She suggests organizing tasks either in a “continue” category or an “outsource” category to determine what you should or shouldn’t be doing for your business. She also suggests thinking about tasks that you need to stop doing in your business, either because they drain too much energy or you just don’t like them. She recommends prioritizing your list by either determining what you like the least, or by what is most cost-effective. Once you determine your priorities, you can use the list to start looking for VAs that have the skill sets you need to be able to outsource that work. Avani gives a couple of suggestions for anyone interested in hiring a virtual assistant or a freelancer. First, create the job description using the list of tasks that you’ve decided to outsource. This contract can always grow and change, but Avani recommends being very clear in the beginning with your expectations and needs. This includes your expectations on what the freelancer needs to do, and your expectations about the time commitment. After creating your job description, the next step is to find the perfect person. Avani recommends using Facebook groups to start your search and connect with potential VAs or freelancers. After identifying potential candidates, take a look at their website or portfolio to get a feel for their work, and try to arrange a time to talk to them and ask them about their previous work. VA or Freelancer: Who Should You Hire? Avani stresses that it’s really important to hire someone who is best suited for the work that you need them to do. She’s worked with both freelancers and VAs, and says that she hires people based on how their skill sets match what work she needs to outsource. VAs may be able to help with a variety of different tasks, but freelancers are often a good fit for specialist or technical work. Avani hired a VA to help with her podcasting, outreach and blog post creation, but she hires designers for specific graphics work. Just like you can’t be an expert at everything yourself, don’t expect your VA or freelancer to be able to do everything. You may need to hire a few different people with different skill sets to outsource all of your tasks. If you’re offering one-on-one services to clients and you’re constantly trying to figure out ways to get new clients, Avani has a great freebie for you. Her free Client Magnet Roadmap has a five-step framework, which she uses herself, to get a steady flow of clients in her business. This framework is how Avani is able to maintain 5-figure months in her business as a service-based entrepreneur. She’s excited for you all to get your hands on that, so check it out at AvaniMiriyala.com/free. © 2019, EdenFried.com. All rights reserved.